Essex wicket-keeper James Foster smashed a whirlwind 83 in just 38 balls at the Riverside to help keep his side's slim Pro40 title hopes alive. Durham looked to have posted a decent target when Phil Mustard's 102 helped the home side run up 276-6. But England's Alastair Cook weighed in with 104 for the second game running. After putting on 117 with Graham Napier, Cook then helped Foster share an unbroken 124 as Essex got home on 279-3 with 19 balls to spare. Foster's knock was his best score in one-day cricket, surpassing the 71 he hit in the Friends Provident Trophy defeat by Derbyshire back in May. And he was nearly responsible for even bigger headlines when he brought the game to a rapid conclusion by hitting the first five balls of the 37th, and what turned out to be final over, from teenage Durham leg-spinner Scott Borthwick for six. Borthwick had bowled well, tying up Cook despite his second successive one-day century. But, with Essex still needing 33 off four overs, Foster suddenly launched a one-man assault on the leg-side boundary. The first two sixes were swept, the second only just clearing Liam Plunkett, then a short ball was pulled, again over Plunkett's head. Two more sixes were bludgeoned to the same area to set up the prospect of six sixes in an over winning the match. But Borthwick speared the last ball past leg-stump, and it went for a match-winning four wides. "We've batted very well over the last couple of days on some very flat wickets. "It's very nice to show some composure from our batting to be able to chase down seven runs per over without panicking. 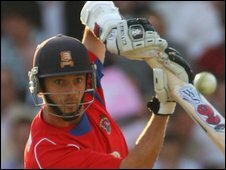 "James Foster played an unbelievable innings and he was probably the difference."